Recover Faster. Train Smarter. Perform Better. With the high school swimming season quickly approaching, it’s time for all the swimmers out there to get ready for the intensity of the season. Being mentally and physically prepared for the season will help ensure that you are able to compete to your best ability and be successful in and out of the pool. So how can you prepare yourself for swim season now? Let’s take a look at five ways you can get ready to get back in the water. A lot of swimmers take a little break from the pool in the off-season and there’s certainly nothing wrong with that! After all, swimming is not only a physical sport but a mental sport as well and taking a break might help you get your mind straight. But now that the season is right around the corner, it’s time to bite the bullet and get back in the water. Starting early rather than waiting until your first practice to jump back in will help you get a feel for the pool again and will also ensure that you’re feeling confident and ready for your first day back at practice. So even though getting in the pool now might be the last thing on your mind, we promise that it will be worth it when it comes time for practice and you’re more mentally and physically prepared than teammates who didn’t get back in the water early. We know that a lot of swimmers chose swimming because they don’t like running or any other dry land sports but taking some time to engage in some cross training during and after the season will increase your overall athleticism and make you a better swimmer overall. Improving athleticism, motor control, and coordination on land will help you move better in the water. Running: Incorporating some interval training with running is a great way to keep your body used to working out and will also help you work your muscles in a different way and continue to tone them even outside of the pool. Core Training: A strong core is crucial to success in swimming. It helps with turns, keeping you swimming straight and overall body position. Working on overall core strength will not only help you improve in these areas, it will also help keep your midsection toned for the season. Mobility: Having increased mobility in the pool will help you perform necessary movements more easily and will also strain your muscles and joints less. Consider incorporating some mobility training such as yoga into your overall routine to lengthen your body and increase flexibility. As mentioned before, swimming is a highly mental sport and preparing yourself to spend hours at a time underwater is important physically and mentally. 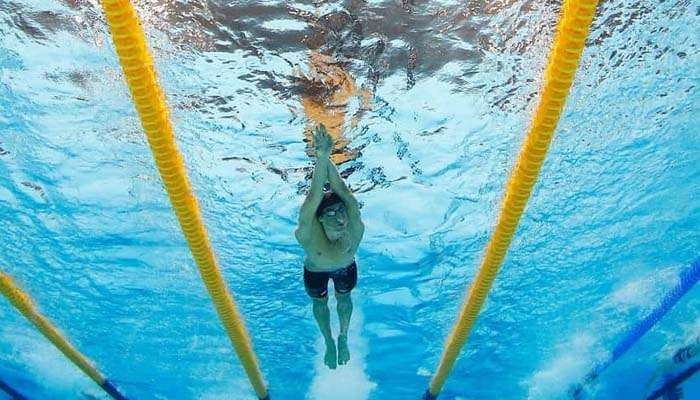 Even some of the best swimmers can struggle with mental holdups in the pool. If you’re concerned that you aren’t ready for the season, it might be worth it to talk to a coach or sports psychologist and get some recommendations for how to mentally prepare. It’s no secret that every swimmer has some weak links. Whether it’s a lack of strength, inconsistent stroke biomechanics or even a lack of feel, identifying weak links before your season starts will not only show you what you need to work on but will give you adequate time to put a plan in place to improve on them. Take some time to get some recommendations from your coach and other teammates on how you can improve your weak areas. Getting additional input will help you put together a plan and will make you more accountable to continue working on the things you need in order to become a better swimmer. Having people to hold you accountable whether it’s your coach, your teammates or a combination of both, will likely make you more motivated to improve. Juggling school and a sport can be a struggle for any student-athlete and swimmers are no different. With long practices, away meets and the exhaustion of practice and competition, it can be hard to focus in class and even more difficult to make sure you finish all your homework and still have time to study for your algebra test on Thursday. Before you get totally overwhelmed with school and swimming and start letting one or the other fall by the wayside, make a plan for how you are going to juggle your studying and your training. This article from USA Swimming has some great tips for making sure you can balance school and swimming. Taking the time to prepare before the season starts will ensure you’re in great physical and mental shape and ready to jump in the pool on that first day of practice. Getting ready for the season in advance is certainly important to your success but there’s also a lot you need to do during the season to keep yourself in shape and training hard. One of the most important aspects of training is proper muscle recovery. Check out our downloadable Day-to-Day Muscle Recovery Checklist to make sure you’re doing everything possible to keep your muscles performing at their peak ability. Learn more about the entire QiVantage product line. All-natural formulas to help you recover faster, train smarter and perform better.